Goals: This woman in her 40’s was concerned about the appearance of her upper eyelids. She was often asked why she looked tired when she felt well rested. 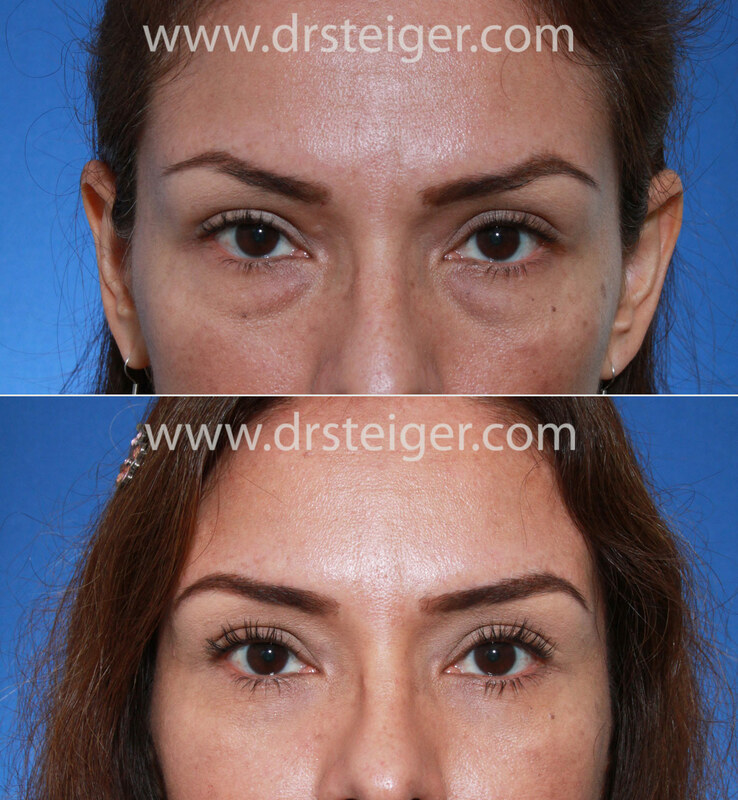 Upper eyelid lift was performed in order to rejuvenate her eyelids and correct the tired appearance. 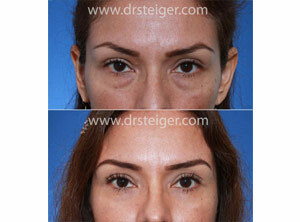 Beofer and after photos show that after the eyelid lift surgery she appears to be better rested. A natural look was achieved. Goals: This young female was concerned about the drooping skin from her upper eyelids. This began at an early age and gave her a tired appearance as soon as she was in her 30’s. A conservative upper eyelid blepharoplasty was performed on her in order to maintain a natural look, avoiding a holllow appearance. 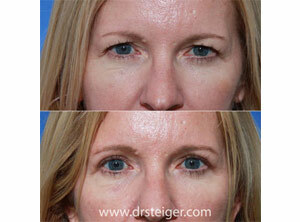 She is seen here after blepharoplasty, several months after her eyelid lift. 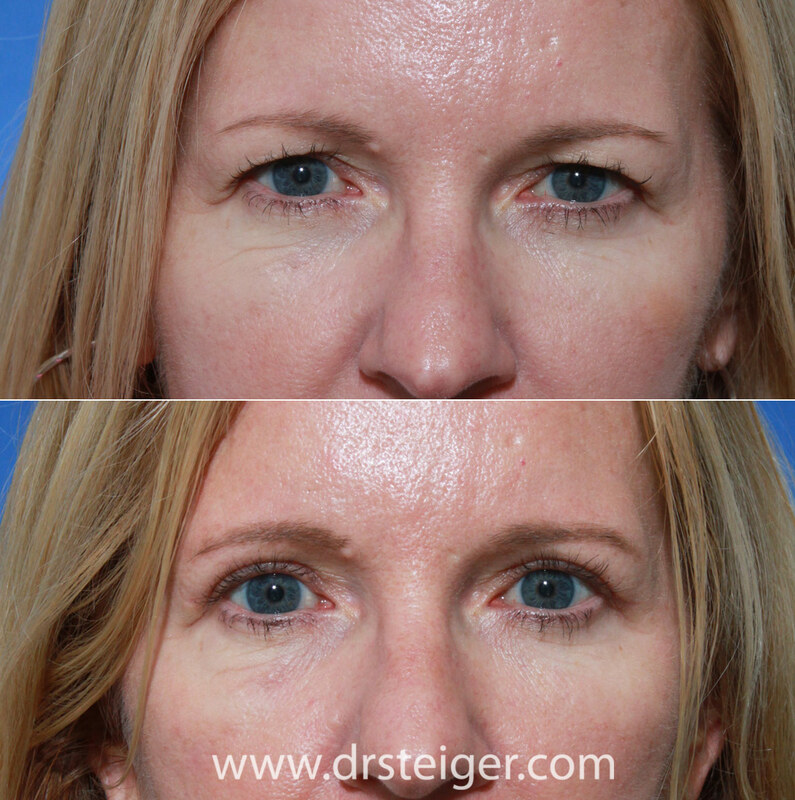 Goals: Lower eyelid rejuvenation was performed on this woman. This included a fat preservation lower eyelid transconjunctival blepharoplasty along with fat transfer to the cheek and lower eyelids in order to correct the volume loss of her midface region. 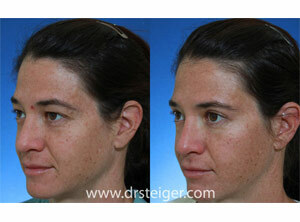 The skin was treated with fractional CO2 laser. Before and after eyelid surgery photos show a more rested appearance to her lower eyelids. Advanced blepharoplasty and facial rejuvenation techniques can lead to the most natural and best appearing eyelid surgery results. Goals: Upper eyelid surgery was performed on this woman in order to giver her a more rested and younger appearance. She has excess skin and hanging skin of her upper eyelids that was treated with surgery. 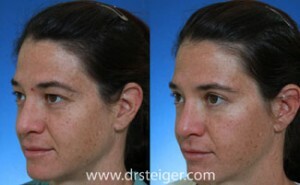 She is seen in this before and after photo 3 months after surgery. 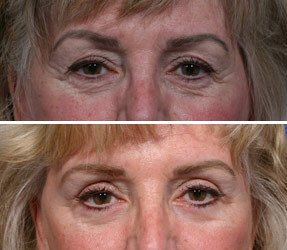 She has a younger and more rested appearance from treating just her upper eyelids only. Goals: Upper eyelid lift and transconjunctival lower eyelid blepharoplasty was performed on this man. 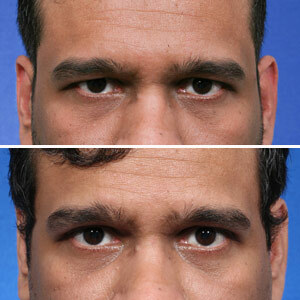 An internal lateral brow pexy (brow lift of the outside portion of his eyebrow through the same incision as the eyelid surgery) was performed as well in order to adjust his brow position. 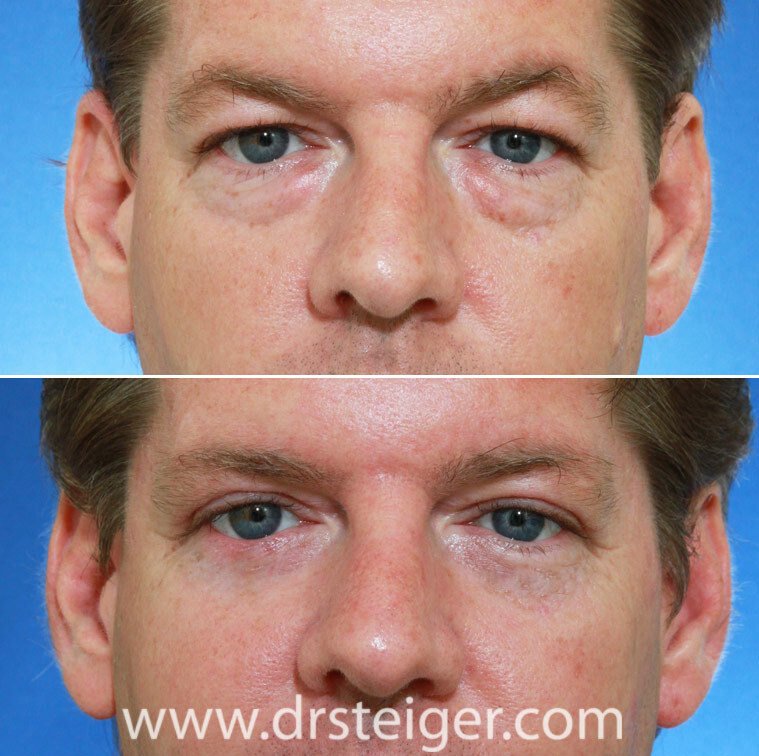 Before and after blepharoplasty photos are shown several months after surgery with a more aesthetic upper eyelid position, no more bags under his lower eyelids, and an improved brow position. Goals: This woman in her early 40s developed bags under her eyelids which gave her a tired appearance. Transconjunctival lower eyelid blepharoplasty (no external incisions or scars) was performed using a fat preservation approach. 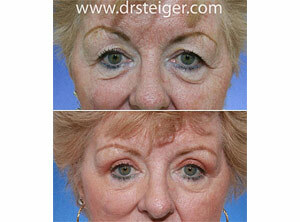 She is seen here several months after her lower eyelid surgery with a more rested and youthful appearance. Notice that the eyelid shape has been mantained to achieve a natural appearance. 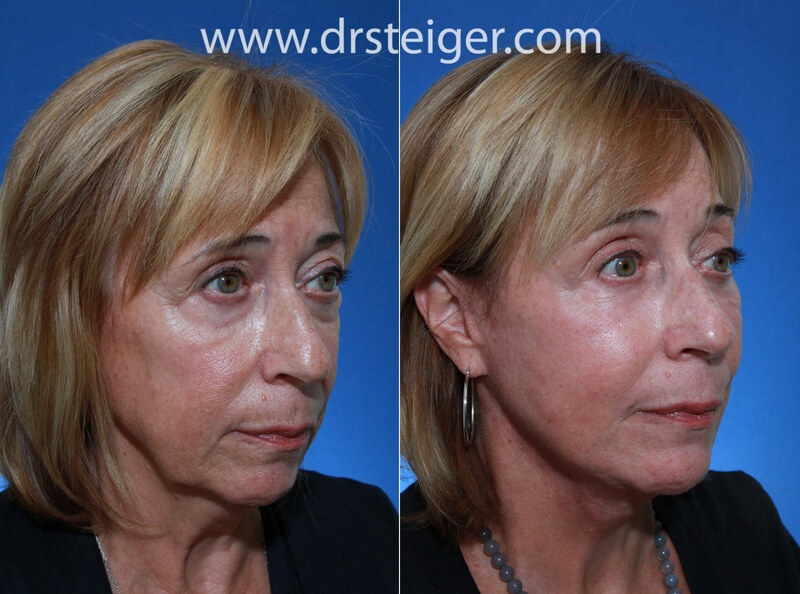 Goals: This patient had an upper eyelid blepharoplasty to remove the heaviness from her upper eyelid. 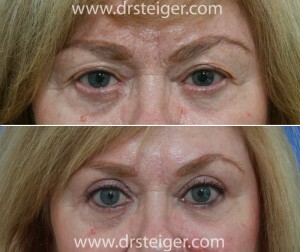 This eyelid lift gives her a more awake and refreshed appearance. Goals: This patient had an upper eyelid surgery to remove the heaviness from her upper eyelid. 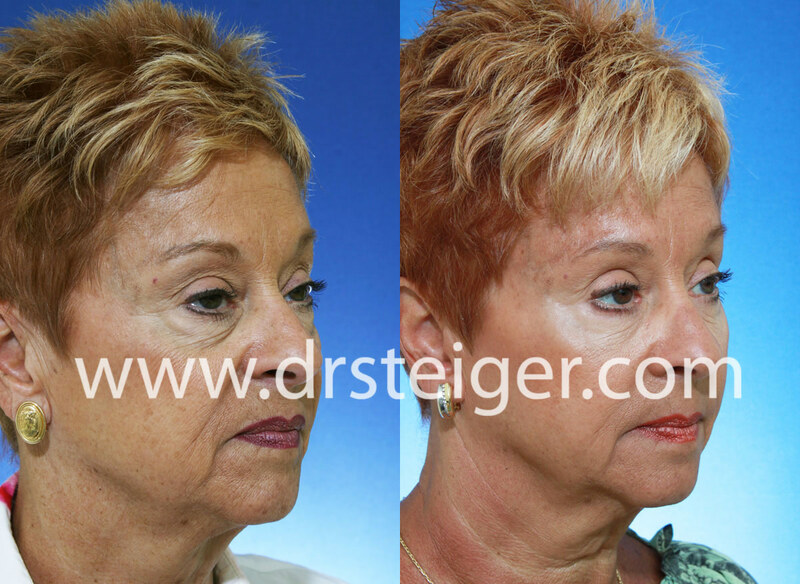 She also had lower eyelid surgery to remove and reposition her lower eyelid fat protrusion. Fat transfer was also performed to restore midface volume. Goals: This patient had both an uper and lower eyelid blepharoplasty. 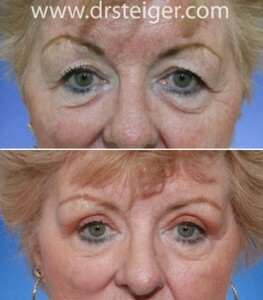 Fat was NOT removed from her eyelids to prevent a hollow look and achieve natural appearing results. 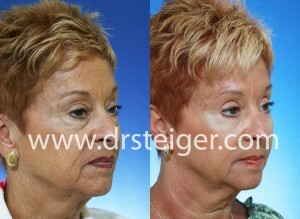 Goals: Periorbital rejuvenation was performed using Dr. Steiger’s fat preservation blepharoplasty techniques. In addition, fat transfer was performed to the lower eyelids in order to fill in the hollowness that has formed with age. 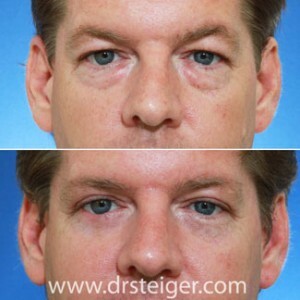 Dr. Steiger’s advanced blepharoplasty techniques achieve a natural appearing result. She is 1.5 years after her eyelid surgery. Goals: Upper blepharoplasty was performed to improve the appearance of the hanging skin of his upper eyelid (lateral hooding). 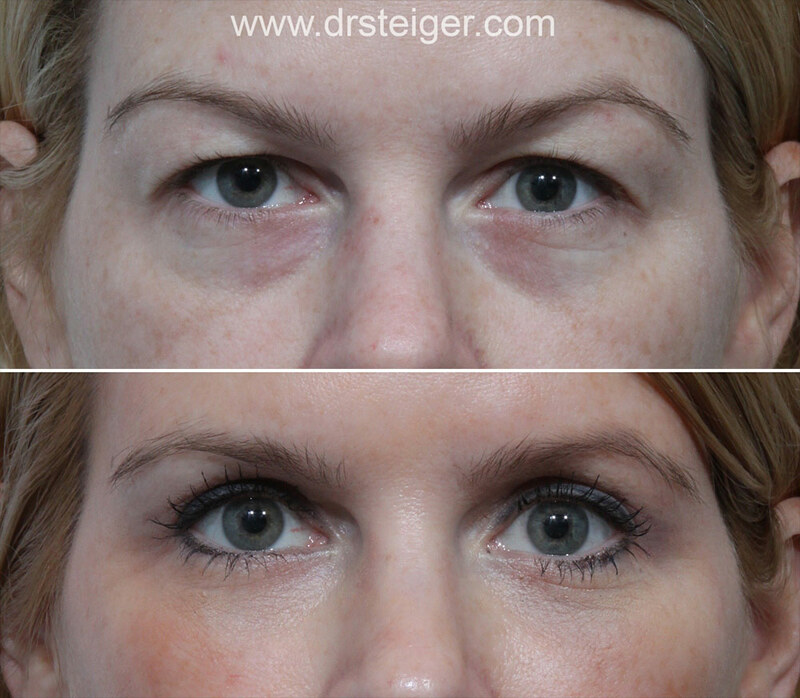 Notice the improved contour of the upper eyelid skin after surgery. Lower eyelid rejuvenation was performed without any surgery incisons. 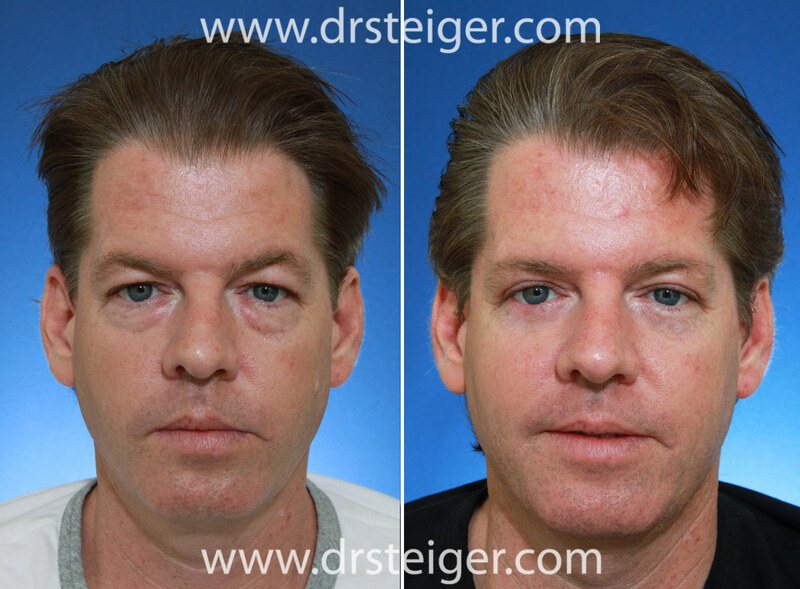 Dr. Steiger’s advanced fat transfer techniqes were used to improve the groove in his lower eyelid called the tear trough deformity. Notice how the tear trough was corrected in the before and after photos. Goals: This patient is in her 30’s. She had an upper eyelid blepharoplasty to correct the heaviness from her eyes. 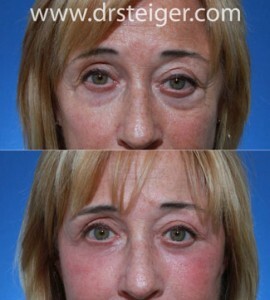 She also had fat transfer to her lower eyelids to fix the hollowness and darkness under her eyes. Goals: This patient had an upper eyelid blepharoplasty to remove the heaviness from his eyes. Dr. Steiger preserved his masculine appearance, while achieveing a more rested, less angry look.